Let us reel you in to this luxurious private 15 acre waterfront gated community known as Anglers Club. 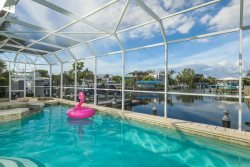 Bring your boat and tie up right outside your 3 bedroom, 3 bath Key-west style townhome for the perfect vacation getaway. Enjoy the morning paper and cup of coffee as you rock away the stresses of life on the sunlit front porch. This gorgeous home offers open concept living and is beautifully decorated with fine furnishings and deep wood finishes. The 1st floor features a bedroom complete with twin beds, and coastal décor, a sleek modern kitchen, and a dining area perfect for entertaining. Open the French doors out to your covered deck and relax as you watch the boats come into the marina. Take the private elevator up to the second level where you will enjoy gorgeous water views from the master suite complete with a king size bed and designer furnishings. French doors invite you to relax in comfort on your private master terrace. The en-suite master bath features warm rich tones, dual sinks and an elegant sleek shower. The 3rd bedroom features neutral tones, a queen size bed, en-suite bathroom, and private terrace overlooking the crystal blue pool. Book this now to lock in your fun in the sun vacation, or call for more details. Rob was very helpful during our stay and communication was excellent through the whole process. We loved Anglers Club! Lots to do around the area and the complex is great. We would definitely stay here again. We worked with Rob, he was excellent, he answered the phone when we called every time, everything was taken care of, couldn't be happier. We enjoyed it very much, hope to return someday!! Robert was so helpful from start to finish. Hard to find people like Robert these days. So kind. Beautiful place with everything you could at your fingertips. Would stay here again. Thank you so much for a great first time experience using Airbnb and for your personal attention to making sure we had everything we needed. Wonderful relaxing place. Interior walls seemed sound proof. Beautiful pool area and walkway along dock. Many large birds from nearby estuary to watch from multiple balconies. Well equipped kitchen. And best of all, a quick and gorgeous ride to one of the most beautiful beaches by far. This is a lovely, comfortable town home, roomy and well-stocked with everything -- from kitchen cookware to beach towels and chairs. Furniture and beds were comfy. There were three of us -- my husband, me, and my mother, and the town home was more than roomy enough for all of us. There are TVs in all three bedrooms plus a very large one in the living room. Wifi works well. The owners were clearly thoughtful. We appreciated the welcome basket of goodies, wine and sun tan lotion. Several balconies, some overlooking the marina channel, are great for morning coffee. Be prepared for a little noise from about 8 to 9 a.m. on the marina-facing side as boats are taken out of storage at about that time. Also, the AC box is located outside next to the first floor balcony and is a bit noisy if you are sitting out there trying to talk. Other than that, this is a very quiet, inviting and pleasant little gated community, tucked behind the marina. The pool, just across the lane, is lovely and peaceful. Generally we were the only ones there in the afternoon. Sometimes there were three or four others, at most. I loved the location of the condo too. It's an easy, 15-minute traffic-free drive over to the island and its idyllic beach and restaurants. Near the island, but not on the island, the condo offers a pleasant way to enjoy its beauty without paying the high on-island rental prices. I'd definitely go back and I would recommend this rental.